The New St. Elias Ukrainian Orthodox Church and Bell Tower, along with an adjacent 1908 church of the same name, are Manitoba’s only surviving intergenerational pair of Ukrainian churches. 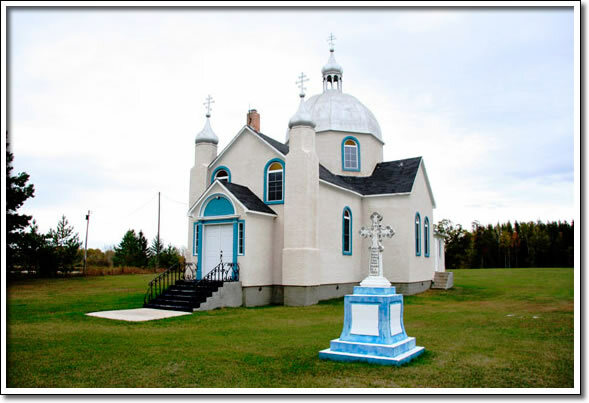 The attractive juxtaposition of the early building, a simple vernacular structure, with its larger, more substantial successor (built in 1950) neatly illustrates the transition from a pioneer to a second-generation Ukrainian-Canadian expression of faith. The newer 1950 church, a cruciform three-domed facility, is typical of later churches built by Ukrainian-Canadians fusing western construction technologies with Ukrainian architectural details. Sitting prominently atop a ridge and in regular use, the church and its bell tower are a focal point of community life for the surrounding agricultural district.